The best ideas come from being active. When starting a new job, if it will succeed or not depends on your idea about how it will work. If we give attention to a few things in every new work, success will walk with us. 1) An idea came, start working on it. When mistakes are made, fix them but do not give up. 2) Gather up information on the idea you are working on. Talk to people about your work. Do not hesitate to consult. 3) Do not go always go with your own thoughts. Become an inventor, not a consumer. Always think about how to make things better and more useful. 4) Keep yesterday’s thoughts in mind along with today's work/thoughts. Think big. Keep a big goal. 5) Keep an eye on the successes of others. Keep an eye on how they work and think. Look at how and where you made mistakes and where they did not. Do not hesitate to adopt the ideas of others for your needs. 6) Make a product according to the place; one product does not work everywhere. Create a product that with only slight changes can fulfill the needs of many. 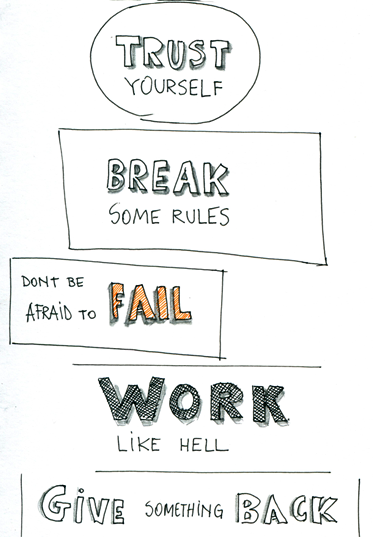 7) Try to take risks sometimes. Walk in a different direction from the market; do something opposite from people’s expectations. Show creativity in shape and colors of your creation. 8) Resolve any problems immediately, do not leave it on tomorrow. Keep the “solving things immediately” as a habit; it will also help with new ideas. Using these ways you will be able to move forward from your problems. To make your identity through your work, you need to give your 100% to your work.